Super high-resolution scans are now available to go from Portland Hospital. Apple's iPod may have almost (but not quite) saved lives before, but this is definitely the first we've heard of providing a window to a life before it even enters the world. According to the Evening Standard, the high-tech Portland Hospital in London has just started a service that provides video from ultrasound scans of babies in the womb to parents who'd like to carry them around on their iPods or compatible mobile phones. 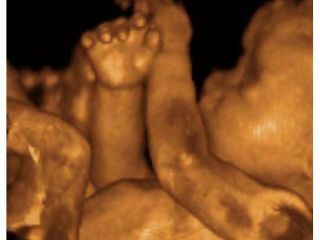 Even better, the images are of the so-called 4D ultrasound variety that is considerably clearer than the traditional fuzzy black and white scans. The technology relies on multiple angled ultrasound beams to give the illusion of depth in the images of the baby in utero. Portland clearly takes security issues seriously too, as the video is made available as a download from a secure website that is password protected for access only by the parents.